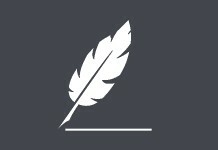 Ligating in India’s courtrooms is not for the fainthearted. It demands drive, passion, determination, persistence, energy and mental stamina. While those in the field speak of the excitement and adrenaline associated with trials, they also admit that such work is financially less rewarding than other avenues of the legal profession. Only those with fire in their bellies survive. For decades, women have fought for their place in the courts, working harder than their male counterparts to prove their worth. After all, women at the bar face challenges far beyond the arduous hours of preparation and mastering of legal briefs. Talk to women in the field and they will tell you that success in court requires thick skin and self-belief as strong as a coat of armour. For years, women were told they didn’t belong, and that they lacked the knowledge and commitment necessary to stay in the game. When they did succeed, they attracted comments that in Indira Jaising’s words, were part of a “patronizing paradigm”. 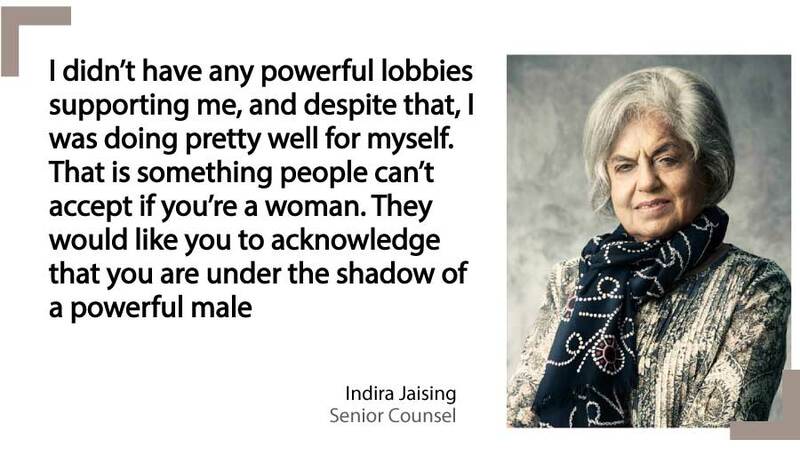 Jaising, the first woman to become a senior counsel in India and the country’s first female additional solicitor general, is synonymous with excellence in legal circles. That someone of her calibre – and indeed any woman lawyer, junior or senior – still experiences a lack of respect in the profession on gender grounds is an ugly truth that the legal community must acknowledge. Jaising honed her skills in Bombay High Court, a forum where she found “a certain openness and a more democratic approach”, which she says gave her the freedom to practise her own way, representing those desperate for justice, such as the victims of the Bhopal Gas Tragedy. She and her husband, Anand Grover, also set up the Lawyers Collective, a non-governmental organization committed to feminist and left-wing causes. Interestingly, Jaising experienced a sense of ostracism much later in her career, partly because of her gender and partly because she rejected the status quo. For Jaising, inequality, nepotism and discrimination are not topics to discuss for the sake of intellectual debate and political correctness. Never afraid of ruffling feathers, she gave up her senior counsel gown in August 2017 in a symbolic protest against discrimination, as she called for a transparent, formulaic and meritocratic appointment of senior counsel, and an end to the different gowns worn by junior and senior counsel. The examples of discrimination that Jaising illustrates are by no means isolated incidents. 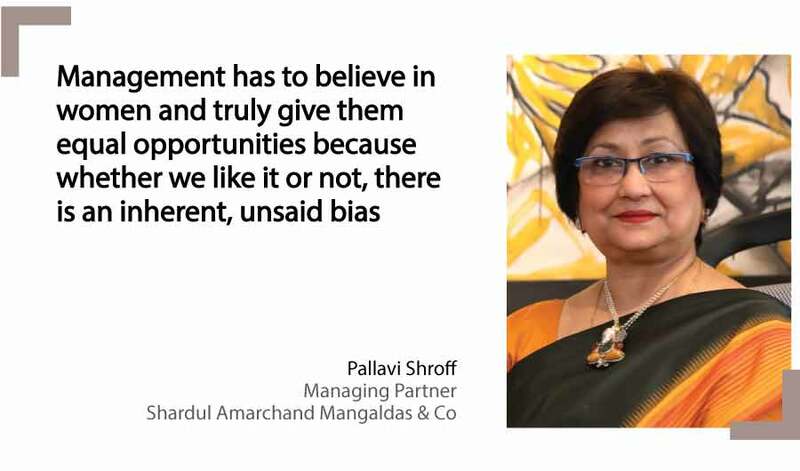 Pallavi Shroff, the managing partner at Shardul Amarchand Mangaldas & Co in New Delhi, admits that gaining the acceptance of clients and courts was a tough task, despite her rich legal lineage. The daughter of former chief justice of India PN Bhagwati, she recalls a time early in her career when clients would refuse to see her, and instead preferred to wait for hours until they could consult her husband. “They would never take me seriously,” says Shroff. Although the perception of defined gender roles is slowly changing, in India, as in many other countries, the image of a woman as a maternal figure in charge of domestic affairs is still difficult to shift. As a result, the responsibility of childcare still tends to fall primarily on a woman’s shoulders. This balancing act and the constant feeling of guilt women tend to feel when they are away from their children leads to both increased pressures and reduced opportunities. “Women will always have dual responsibilities – that will never die,” says Shiraz Patodia, a senior partner at Dua Associates in New Delhi. Early on in her career, Patodia recalls, “I would run home any chance I got during the day to see my six-month-old son and check whether he was in good hands. I could never keep up with the ‘boys club’ and the culture of drinks after work, because I had to be home with my son and husband.” Men, says Patodia, have fewer expectations thrust upon them and so “gallivanting around until midnight” is never an issue. Women, however, are often unable to partake in these relaxed bonding opportunities, which can tangibly affect how their workplace relationships develop. There is general consensus that women corporate lawyers, and even those pursuing arbitration, have witnessed a higher degree of gender parity when compared with women practising litigation. 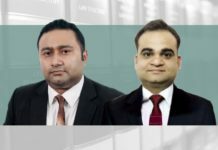 Companies and law firms in India have begun to view gender diversity, and diversity overall, as a corporate gain – a way to enrich perspectives and foster growth. 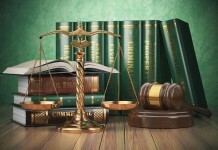 In an effort to encourage greater participation from women in these sectors, some law firms and companies have re-examined their workplace policies and devised flexible work arrangements, stronger anti-harassment rules, increased safety initiatives for women staying late, and crèche facilities for new and nursing mothers. As a result of these concrete measures, women feel supported and valued by these organizations and are thus motivated and able to retain their positions over the long term. Why, then, has the courtroom remained so unequal and male-dominated? And what are the mechanisms, structures and processes that keep it this way? A disorganized court system plagued by unpredictable scheduling could be one reason. 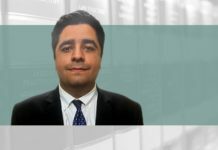 Unlike the corporate sector, where lawyers can to some extent anticipate the timetable of a transaction, litigating lawyers have no such control. 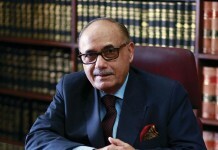 So for those with children, health issues, or duties towards elderly relatives, among other responsibilities, the erratic timings of court practice are simply unviable. 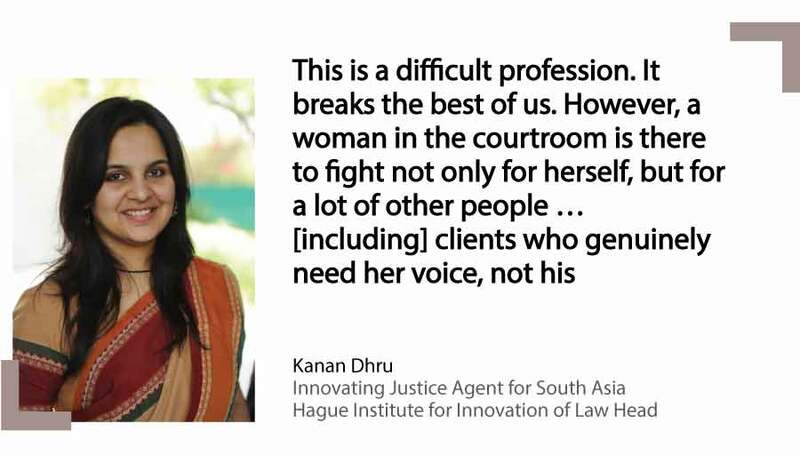 Kanan Dhru, an Ahmedabad-based innovating justice agent for South Asia at the Hague Institute for Innovation of Law, has seen first-hand the kind of discrimination women face in court. 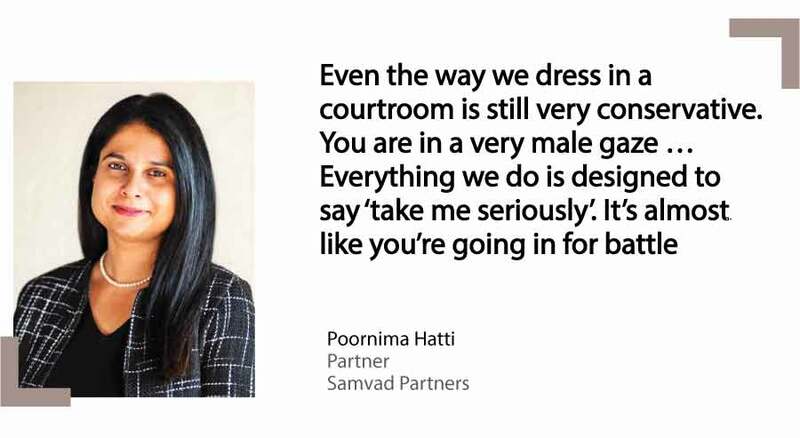 She argues that more women are needed in the legal ecosystem, particularly at the bar and bench in order to dismantle patriarchal and stereotypical attitudes. 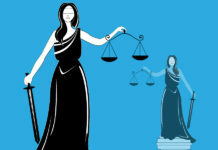 The presence of high-profile women litigators, senior counsel such as Jaising, Meenakshi Arora and Jayna Kothari, and judges such as Justices Indu Malhotra, Indira Bannerjee and Prathiba Singh, offer evidence that women’s excellence in lawyering does not always go unnoticed. While the successes of these lawyers and judges suggest a slow transformation in attitudes towards gender, they speak volumes for the tenacity of these individuals and their will to thrive despite being underestimated, underrepresented and undervalued. Although initially infuriated by her clients’ dismissiveness, Shroff was determined to persevere and demonstrate her capabilities. “You couldn’t afford to be angry because you wanted to prove your worth,” she says. Shroff also benefited from an immense support system in the form of her mother-in-law encouraging her to work while she helped out with the kids, and her husband, who she says, “wanted me literally and truly to be an equal partner, to share responsibilities with him and to go out and make a name for myself”. For Jaising, whose core work is human rights law, it was the passion to work for those with little access to justice that drove her and provided her with the greatest learning experiences. “It was purely the desire to represent those who were not represented in the mainstream legal profession,” she says. “Doing that for me professionally not only gave me the largest amount of pleasure, but it also honed my skills, because if you are representing people who are on the margins of society, you have to be better than everyone else. Or else, you need to be very well researched with the law if you want to make any impact and succeed. A range of factors contributes to this feeling of being unwelcome. Nandini Khaitan, a partner at Khaitan & Co, wrote recently in the BAI’s journal, The Indian Advocate, of her experience at a district court in West Bengal where there were no toilets for women inside the court building. Instead, she was shown “a small enclosure covered on three sides, outside the building but within the court complex”, comprising “a tarpaulin roof pitted with holes, and a tin door which did not lock”. According to a report last year on the state of physical infrastructure in the lower judiciary by Vidhi Centre for Legal Policy, the toilets in most courts were dilapidated, inaccessible and unclean. Bharatpur District and Sessions court had no toilet for women altogether. Poor infrastructure and opportunities beyond India’s metropolitan cities create further cause for concern. 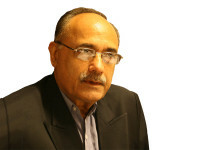 “There is still a sense of deprivation,” says Ahuja. 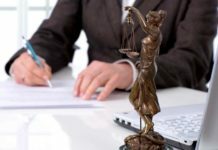 The lack of infrastructure, opportunities and pay in smaller towns mean that if women want to pursue litigation, they will often move to bigger cities to do so. As a result, the bar and bench in these parts of India remain less gender-diverse, with poor facilities for women and under-representation. This is where the dangerous domino effect begins – fewer women in the lower courts equals fewer women in the higher courts, which eventually ends with fewer women sitting at the bench. Of course, not all is in the negative. Women at the bar today have greater opportunities than their predecessors and a more supportive environment in which to pursue careers in litigation. The generational change and open discussions about gender and equality, at least among those in urban India, mean women more often refuse to tolerate discriminatory language and patronizing behaviour, and instead, fearlessly challenge such conduct. Many young women today are confident that they can have a happy work-life balance on their own terms, regardless of their marital status, or whether they have children. And slowly, but surely, their employers are beginning to understand how they, too, can benefit by providing women employees with equal opportunities, support, security and flexibility. Many women passionate about advocacy may be prepared for such frustrating encounters. But there are others who are unwilling to tolerate short-term discrimination for long-term career gains. Ahuja often advises younger women on her team to adhere to certain conventions of dress and demeanour, and to let their work do the talking. She appreciates that many women would question the logic of this approach, but argues that “society at large is still tilted towards men … and if you want to prove yourself in the profession, you must accept these realities”. Ahuja’s philosophy is not about discounting the fight against patriarchy, nor does she discourage women from speaking up when they are patronized, harassed or treated unfairly. “Real upliftment is giving opportunities to women,” she says. “It is women supporting other women, which is what we are seeing. Accepting the basic fact that there’s always a difference between women and men is necessary. Society will change when it changes; women will help it to change. Many men will support you too. 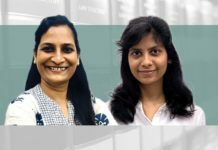 Dhru is keen to see more diversity in courts across India and hopes aspiring women lawyers will not abandon the pursuit of a career in litigation on account of gender-based challenges. She urges lawyers to consider why they chose to study law, to think about the impact of their work, role and purpose in the profession, and to realise that the entire justice system works through individuals. Many of India’s most prominent women litigators saw few, if any, women in leadership roles during the early part of their careers. As a result, they relied on male family members, mentors and role models for support at home, and coaching and guidance in court. 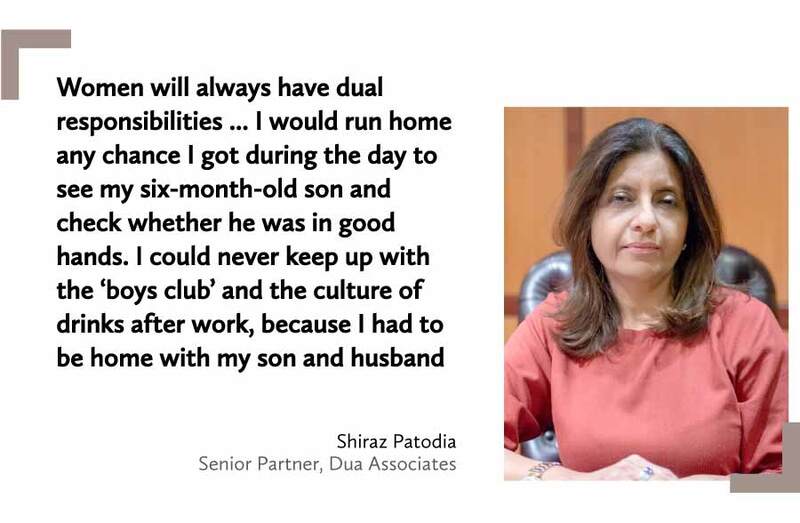 Shiraz Patodia, a senior partner at Dua Associates, held on to her career thanks to “an understanding husband and an intelligent son” who required no extra tutoring from her after school. 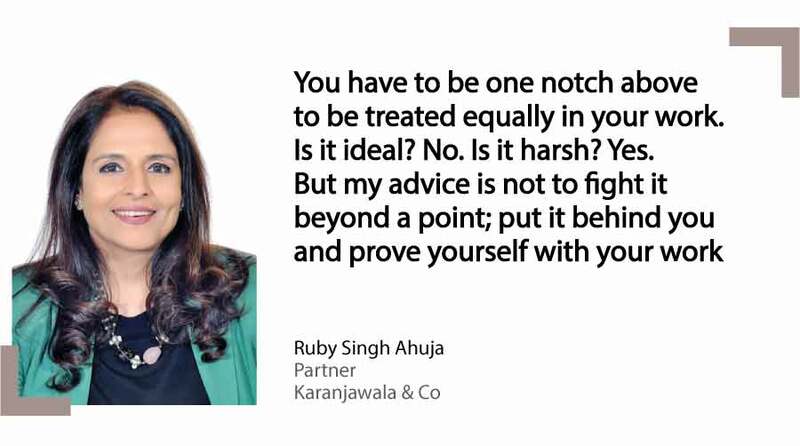 She also credits senior solicitors AR Wadia, senior partner at Crawford Bayley, and Dakshesh Dhruv, senior partner at Dhru & Co, who helped her and pushed her to succeed. “The men in my life really helped me to grow,” she says. Pallavi Shroff, the managing partner at Shardul Amarchand Mangaldas & Co, cites numerous mentors including: Her father-in-law, Suresh Shroff, who taught her discipline and how to organize her case work; her father, Bhagwati, who emphasized the need for humility; senior counsel Murlidhar Bhandare, a good family friend who helped her prepare for particular trials. Why do we need more women at the bar? 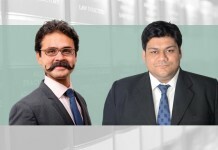 The women interviewed by India Business Law Journal offer several reasons, among them that diversification of the bar and bench creates a legal system that is more representative of society and one that offers different perspectives on justice and equality. 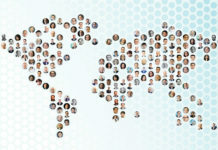 It also provides women with access to positions of power, allowing them the chance to share unique viewpoints and offering them decision-making abilities on matters that will have far-reaching consequences for the corporate world and society at large. Jaising hopes that her call for transparent rules and criteria in the appointment of senior counsel will attract more qualified women candidates and other marginalized groups less likely to make it to the bar and bench under the existing framework. For example, those with a legal lineage tend to find opportunities and promotions more easily than first-generation lawyers.